Walt’s birthday. An epic day for comics and animation! This day has to be dedicated in comics & animation! Walter Elias “Walt” Disney was born as today on 5 December, 1901. This immense American film producer, director, screenwriter, voice actor, animator, entrepreneur, entertainer, international icon,and philanthropist, well-known for his influence in the field of entertainment during the 20th century, along with his brother Roy O. Disney, he was co-founder of Walt Disney Productions. One of the best-known motion picture producers in the world. park design. He and his staff created some of the world’s most well-known fictional characters including Mickey Mouse, for whom Disney himself provided the original voice. During his lifetime he received four honorary Academy Awards and won 22 Academy Awards from a total of 59 nominations! Actually he made a record in one year that he gained 4, giving him more awards and nominations than any other individual in history. This enormous cartoonist and film maker also won seven Emmy Awards and gave his name to five theme parks around the world! We’re really supporting comics, cartooning, comic strips and animation! We support them for the great art they are..
What happened on November 18, 1928 exactly 84 years ago? Steamboat Willie is a 1928 animated short film directed by Walt Disney and Ub Iwerks. Who doesn’t know the guys? It was produced in black-and-white and it is considered the debut of Mickey Mouse and his girlfriend Minnie. But these two fellows had appeared several months earlier in test screenings. Even though Steamboat Willie was the third of Mickey’s films to be produced, it was the first to be distributed. 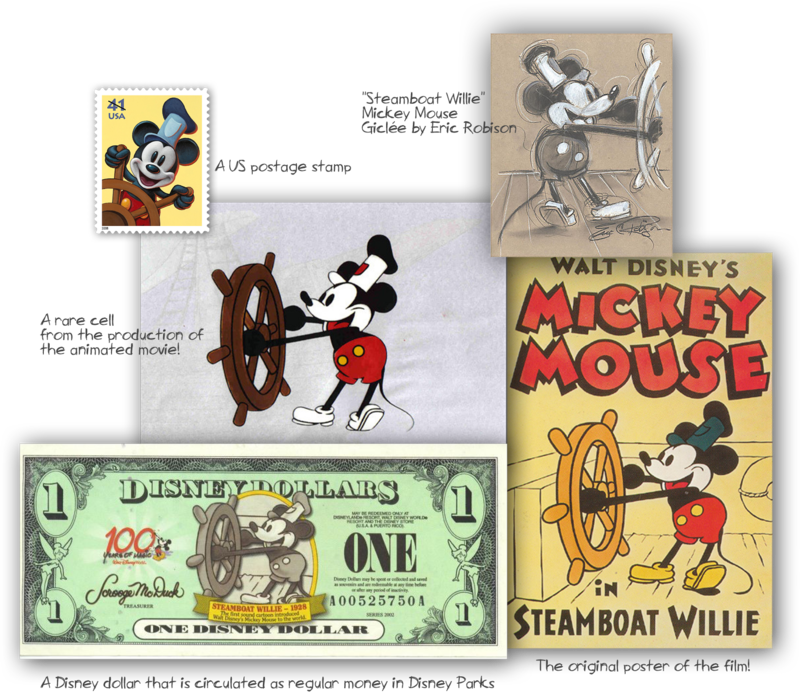 You can find a lot of paper items original or reproductions about Steamboat Willie film. It’s really fun to collect Disney items and there are a lot of enthusiasts around the world that are crazy about this material!